I have sort of a love/dread relationship with Varanasi. Since I got involved with the lepers when I was here in 2001, the place has always stretched me in uncomfortable and unexpected ways. Some of you will remember that when I was here last time I tried to help a little girl, Poonita, who had burned her arm very badly. It had been healing for a month when I first saw her, and she was not allowing her arm to bend even a little. I thought that her arm would freeze in that position and never improve without therapy. So on a chance, I paid for a month's worth of physical therapy (for $20!) that I was pretty sure would be a waste of time. If you want to read the original story and photos from three years ago, it's at this link. The good news is that I saw Poonita, and her arm is as good as new. The strange thing is that although I didn't recognize her, she kept saying to me, "I'm Poonita. 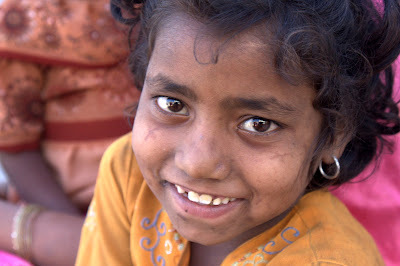 Poonita/Sunita. You remember?" I mistook her for some other street kids that I knew, but she kept up and I finally figured it out. She was only four (or so) when I took her to the hospital, so I'm amazed that she remembered me. Her living situation is perhaps just as desperate as it was last time I saw her. Her mother, who was also happy to see me, now has six kids, and all the kids are wild and caked with dirt. I asked around about paying for the kids to go to school, but it's so difficult. There's no structure to get money to a family like theirs, or to know that they're using the money like they should. And as soon as money gets involved, the relationships change and get complicated. I ended up spending time with Poonita and her sweet and beautiful sister Sunita - and I never gave them anything except my attention and love. That counts for something, for sure, but when there's such need it's hard to know what should be done. One day I was saying hello to some of my leper friends and an Indian man asked me to go look at someone who "has been hit by a truck or something. I don't know. You see. Maybe you help." Yes, boss, but I'm not a doctor - I just play one when I'm on vacation. "You just see. Maybe you help." It was like deja vu from working on the ghats - walking up to where this man was, laying on the street next to other beggars, not knowing what we'd see. He had one missing foot from and injury years back, but had apparently recently.broken the femur of his other leg, so he couldn't move at all. As we're standing in the baking sun, wondering if there's something we could do, an Indian man who I've known for years (and who I don't really trust) started translating. He said he's just a beggar, and not to get involved. We said, yeah, but he can't even move. He said "Of course he can! He's here now - he wasn't here yesterday!" Geesh. We slinked off, not getting involved mostly because no course of action seemed reasonable for tourists. That didn't feel so good. But just to torment myself, I walked by him the next two days, and he was still laying there in the sun. And he still gave us a palms-joined namaste greeting, in spite of our inaction. This place - I'm tellin' ya. Sonnu, son of Anita, who I've known for years. 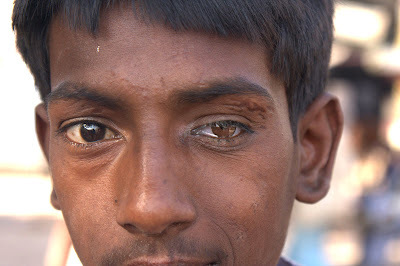 He lost an eye when he was cut with a broken bottle. 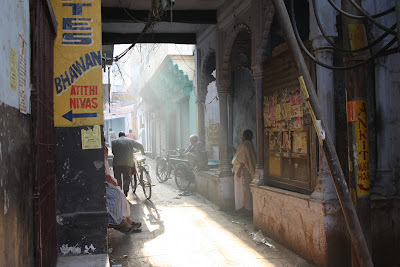 One of the lanes of Varanasi. 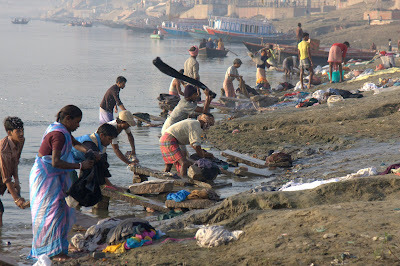 Dhobi wallahs washing clothes in the Ganges.